Dr. Jahangiri provides new fixed-in teeth during a one-day procedure. You will be able to eat what you want, smile with confidence and enjoy an improved quality of life! A seemingly hopeless smile can be replaced with a stable and healthy one in a single day with the New Teeth in One Day procedure. Your new teeth will look, feel and act very much like natural teeth. To support a full arch of replacement teeth for either the upper or lower jaw, a minimum of four specially designed dental implants are strategically placed at angles—allowing Dr. Jahangiri to take advantage of the densest areas of bone. This eliminates the need for bone grafting, and Dr. Jahangiri can, in most cases, provide this procedure even to patients suffering from severe bone loss as a result of wearing dentures. Because no bone grafting is needed, New Teeth in One Day is the most economical fixed in, full-arch tooth replacement option. The practice’s 3D CT scanner provides detailed images of the entire mouth in 360-degree view. 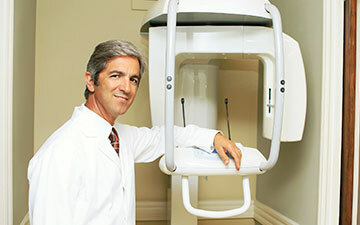 Dr. Jahangiri first takes full 3D X-rays using his in-office dental CT scanner. This enables him to find the areas of densest bone and the best locations to place implants. He then uses special treatment planning software to virtually plan out the implant placement ahead of time. 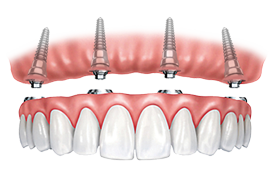 Next, a surgical guide is created that is placed over the gums during the implant surgery. 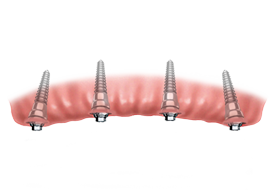 This guide enables Dr. Jahangiri to place the implants accurately and efficiently. Dr. Jahangiri performs any needed extractions on the same day. 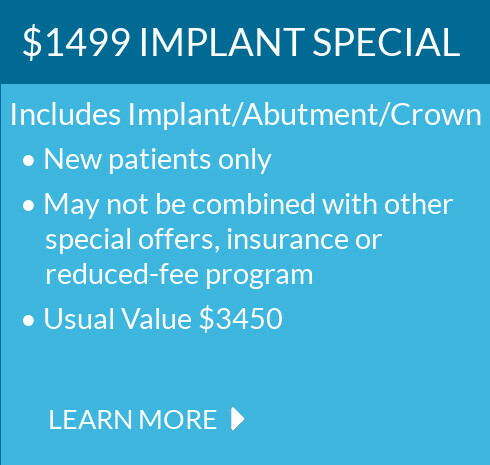 After your implants are placed, you will immediately receive aesthetic, fixed-in temporary teeth to wear while your implants fully integrate with the jawbone. When the healing process is complete, Dr. Jahangiri places very strong and beautiful final teeth that provide nearly full chewing power. The final teeth are made of zirconia, an ultra-strong and lifelike dental ceramic that is among the latest advances in dental materials. If needed, Dr. Jahangiri will have technicians from our dental lab come to the office to provide you with a direct consultation. Dr. Jahangiri will ensure that your new teeth result in a well-aligned bite and that they complement your features. 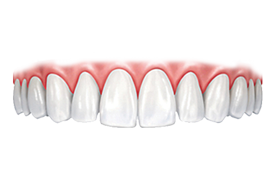 Find out if you are a candidate for New Teeth in One Day and learn more about the treatment. If you would like to schedule an appointment at Portside Dentistry today, call (949) 612-2468, fill out our Appointment Request Form. We are conveniently located at 351 Hospital Rd #201, Newport Beach, CA 92663. We look forward to your visit and taking care of all your dental needs! Call Today! (949) 612-2468 or fill out form below. At Portside Dentistry in Newport Beach, your smile is our top priority. Our experienced and caring dentists, Dr. Hossein Jahangiri and Dr. Noor Khedraki, are dedicated to providing you with the personalized, gentle dental care that you deserve. We offer cosmetic dentistry, such as Invisalign, Dental Implants and ZOOM! Teeth Whitening, as well as dental cleaning, oral exam, root canal and laser dentistry. Portside Dentistry uses the finest materials and latest dental techniques to give patients beautiful healthy smiles in a safe, relaxed and caring atmosphere. Site created by Gilleard Marketing, doing business as Gilleard Dental Marketing. ©2018 Gilleard Marketing, a California corporation. All rights reserved. This material may not be published, broadcast, rewritten or redistributed. Custom photographs and custom copy ©2018 Gilleard Marketing.